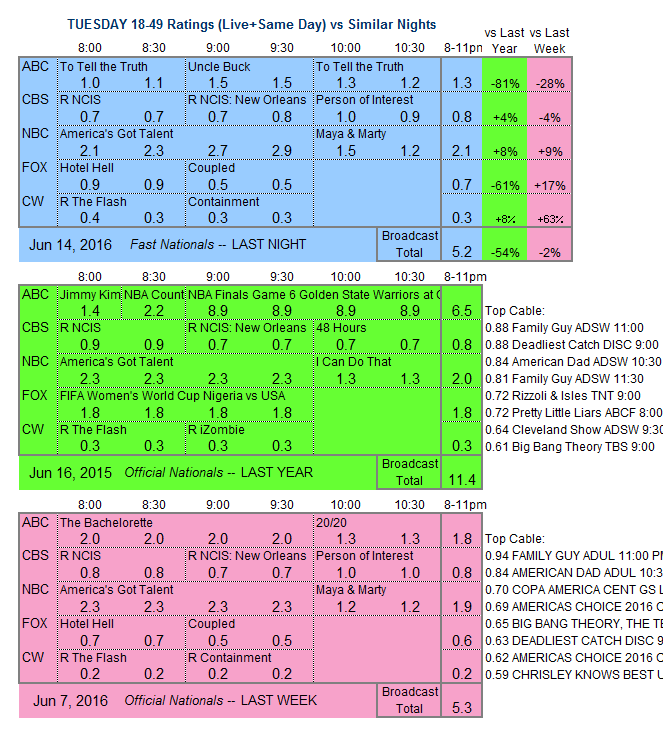 Fair results for some ABC premieres. ABC: Two episodes of UNCLE BUCK were sandwiched between two episodes of TO TELL THE TRUTH on an all-premiere night, and the strategy worked. All the shows were at about the same level of total audience (5.2-5.4M), but UNCLE BUCK skewed younger, giving it a solid (and steady) 1.5 in the demo, with the 8PM TRUTH at 1.0 and the 10PM edition rising to 1.2. NBC: Without having to face THE BACHELORETTE this week, AMERICA’S GOT TALENT rose 0.2 to 2.5, and that boosted MAYA & MARTY by 0.2 to 1.4. CBS: After 0.7-0.8 reruns, the next-to-last PERSON OF INTEREST held at 1.0. 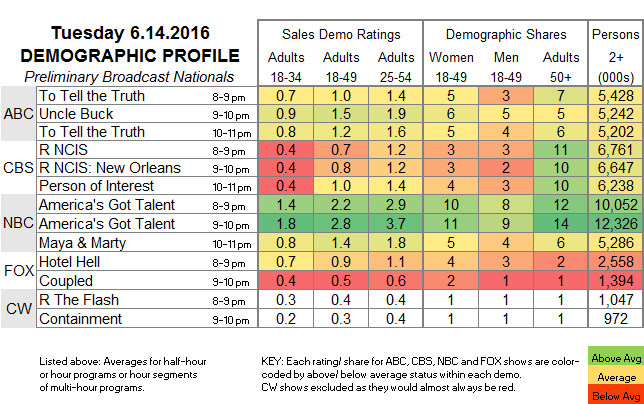 FOX: HOTEL HELL gained 0.2 to 0.9, and COUPLED remained at 0.5. CW: A new episode of CONTAINMENT couldn’t even hold its 0.4 lead-in from a rerun of THE FLASH, returning from a week off down 0.1 to 0.3. It’s going to be a quiet TV night, as only THE NIGHT SHIFT, MASTERCHEF and WAYWARD PINES offer new episodes.